When all is said and done, our lives are like houses built on foundations of sand. One strong wind and all is gone. Masaki Kobayashi's Harakiri (1962) is a anti-chambara film that subverts the idea of the honorable samurai and calls into question the very tenets of Bushido and authoritarianism. It won the Special Jury Award at the 1963 Cannes Film Festival and is considered a masterpiece for many. 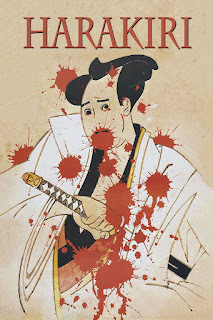 The film takes place in Japan during the beginning of the Edo period and concerns the fate of Tsugumo Hanshiro (Tatsuya Nakadai) a ronin who has come to the estate of the Ii Clan to request use of their courtyard to commit harakiri. In order to dissuade him the Daimyo's head counselor tells him the story of a previous samurai who requested harakiri that ended badly. It had become commonplace for ronin to come to the clan to ask for services and rather than provide the ceremony the clan would give them money in exchange for leaving their domain. Hanshiro pushes on with his request, but before he does so he asks to relate his life story before killing himself. This is where the narrative of the film becomes important as Hanshiro's tale re-contextualizes the anecdote that the head counselor initially relayed to him. What really happened is revealed piece-by-piece by Hanshiro until the shocking revelations in the third act blow everything apart. Director Kobayashi was a pacifist and his work definitely has an anti-establishment thread running through it. Hanshiro spends the entire film deconstructing the very idea of Bushido and the meaning of honor. The Ii Clan say they are honorable but their actions do not demonstrate it--they value the appearance of nobility more than actual nobility. Government and authority abusing their power is nothing new, and this subtext makes Harakiri feel relevant even in modern day. 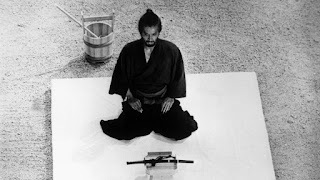 In most samurai films they are portrayed as heroes but in Harakiri they are depicted as hypocrites who preach an ideology that they do not follow. Harakira is a gorgeous film with its careful panning shots and contemplative close-ups. Although it is a narrative-driven film, the last third has some incredible action set-pieces with beautiful choreography. Toru Takemitsu's traditional score is rather sparse, but when it comes in, with its foreboding chords and hard percussion, it almost feels more befitting of a horror film rather than a samurai picture. Tatsuya Nakadai's performance is intense as he goes from bemused resignation to a snarling beast through the course of the film.